Background : Two most important causes of portal hypertension are cirrhosis of liver and non-cirrhotic portal fibrosis (NCPF). The purpose of this study was to assess the scintigraphic appearances of Tc99m sulfur colloid liver scan in differentiating liver cirrhosis from NCPF. Materials and Methods: Retrospective analysis records of 146 patients (91 male and 55 female) with diffuse hepatocellular disease was done for liver size, liver uptake, spleen size, spleen uptake, colloid shift to bone marrow and lungs. 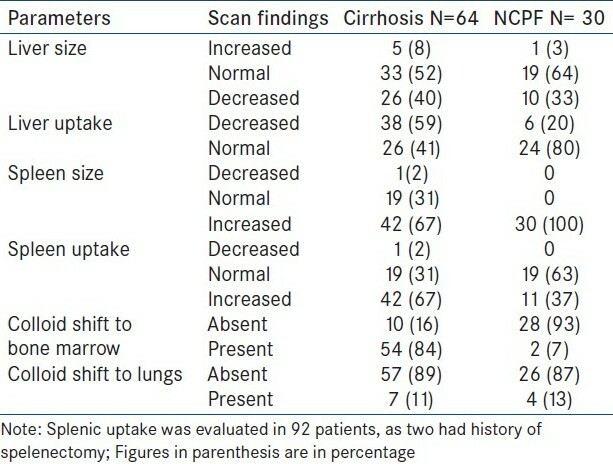 Results: Cirrhotic livers showed patchy and lower uptake than NCPF (59% vs. 20%, P-value 0.041). Spleen size was significantly increased in NCPF compared to cirrhosis (100% vs. 67%, P-value 0.0137). Significant colloid shift to bone marrow was noted in cirrhosis (84% vs. 7%, P-value<0.0001). Conclusion: Tc99m sulfur colloid liver scan is a non-invasive procedure having a useful adjunctive role in clinical differentiation of cirrhosis from NCPF. Liver biopsy is gold standard but it is invasive and a risky procedure in these patients with altered coagulation profile. Tc99m sulfur colloid has been used as an imaging agent for the liver and spleen. Subjective assessment of parameters such as the dimensions of the liver and spleen, colloid shift and uptake of radiopharmaceutical in the bone marrow have been used for both diagnosis of liver cirrhosis and evaluation of its progression. The distribution of radio-colloid uptake in the liver, spleen and bone marrow has been shown to correlate well with the severity of chronic liver disease, the severity of histological fibrosis, prognosis and hepatic function. ,,, This study was designed to assess the uptake patterns of Tc99m sulfur colloid in cirrhosis of liver and NCPF. We retrospectively analyzed the studies of consecutive 146 (91 male, 55 female) patients of diffuse hepatocellular disease based on clinical and laboratory findings referred for Tc99 sulfur colloid liver scan. Age range was 8-78 years (mean age 36 years ± 14.6). All patients underwent Tc99m sulfur colloid liver scan 30 minutes after intravenous injection of 4mCi of the radiotracer. 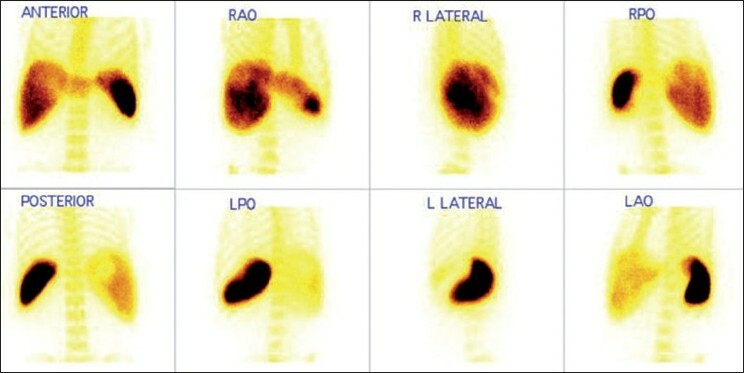 Eight [anterior, posterior, right anterior oblique, left anterior oblique, right posterior oblique, left posterior oblique, right lateral, left lateral] isocount (500000) planer images were acquired in 256×256 matrix under a dual head gamma camera equipped with low energy high-resolution collimator (E.Cam, Siemens, Erlangen, Germany). 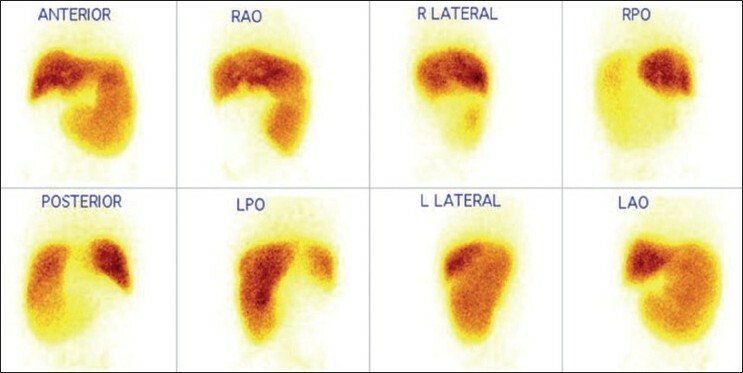 Images were visually interpreted for liver size and uptake, spleen size and uptake, and were graded as normal, increased or decreased in size or uptake with reference to normal scan. The sulfur colloid uptake in the bone marrow and in the lungs was evaluated as present or absent in all the scans. Values are expressed as mean±1 SD (95% confidence interval for the mean). Analysis of qualitative variables was done by non-parametric Mann-Whitney U-test. Differences were considered significant if the P-value was <0.05. Hepatocytes and Kupffer cells are equally affected by the ﬁbrotic process in patients with liver cirrhosis. ,, Variable involvement of portal tracts known as obliterative porto-venopathy of liver is commonly seen in NCPF. NCPF is diagnosed by the presence of unequivocal evidence of PH in the definite absence of liver cirrhosis and EHPVO. The disease is characterized by massive splenomegaly with anemia, preserved liver function and benign prognosis in a majority of patients. Although differential diagnosis from liver cirrhosis is not always easy, liver histology, laparoscopy, portography, hepatic venography and measurement of WHVP have been shown to be useful in diagnosis. Relative distribution of radioactive colloid in cirrhotic livers using planar and SPECT techniques has been studied and reported previously.,, They showed that the Kupffer cell mass determined by the degree of relative hepatic and splenic uptake of colloid particles by the cells of the reticuloendothelial system correlates with disease severity and hepatic function in liver cirrhosis. They also implied that radioactive colloid distribution is a better estimate of disease severity than invasive tests. Thus, the uptake of radioactive colloid by the liver could be used to evaluate cirrhosis. Spleen volume undergoes modifications during the course of chronic liver disease. Measurement of spleen size and individual uptake of radio colloid by the spleen could be useful in evaluating spleen hyper function in patients with cirrhosis. In our study colloid shift to the bone marrow (84 % vs. 7%), and decreased liver uptake (59% vs. 20%), was seen more often in cirrhotic group. Increased spleen size (100% vs. 67%) with no evidence of colloid shift to the bone marrow (84% vs. 7%), was more suggestive of NCPF. However, we could not compare our results with the gold standard histopathology for the final diagnosis. Increased bone marrow activity has been described in 16.6, 44. and 72.72% patients with Child A, B and C cirrhosis respectively. Normally approximately 85% of the colloid is trapped in the kuffer cells in the liver and remainder goes mostly to spleen and bone marrow. Distinguishing pattern in cirrhosis is explained by cirrhotic liver's decreased extraction efficiency for the blood-laden colloid due to pH, extra- and intra-hepatic arterio-venous shunt and replacement of the liver parenchyma and sinusoidal kuffer cells by fatty infiltration, necrosis and fibrosis. Thus colloid not extracted by the diseased liver recirculates through the bone marrow and spleen and is engulfed by reticuloendothelial cells of these areas, resulting in significant uptake in the bone and spleen. In conclusion 99mTc sulfur colloid liver scan is a non-invasive procedure having a useful adjunctive role in clinical differentiation of cirrhosis from NCPF. 1. Cirrhosis-MayoClinic.com available from: http://www.o.com/print/cirrhosis/DS00373/DSECTION=allandMETHOD=print. [Last accessed on 2010 Nov 22]. 2. Liver Cirrhosis. Review of Pathology of the Liver. Available from; http://www.meddean.luc.edu/lumen/MedEd/orfpath/cirhosis.htm. [Last accessed on 2010 Nov 22]. 3. Reynolds T, Ito S, Iwatsuki S. Measurement of portal pressure and its clinical application. Am J Med 1970;49:649-58. 4. Bosch J, Mastai R, Kravetz D, Navasa M, Rodes J. Hemodynamic evaluation of the patient with portal hypertension. Semin Liver Dis 1986;6:309-17. 5. Sarin SK, Kapoor D. Non-cirrhotic portal ﬁbrosis: Current concepts and management. J Gastroenterol Hepatol 2002;17:526-34. 6. Dhiman RK, Chawla Y, Vasishta RK, Kakkar N, Dilawari JB, Trehan MS, et al. 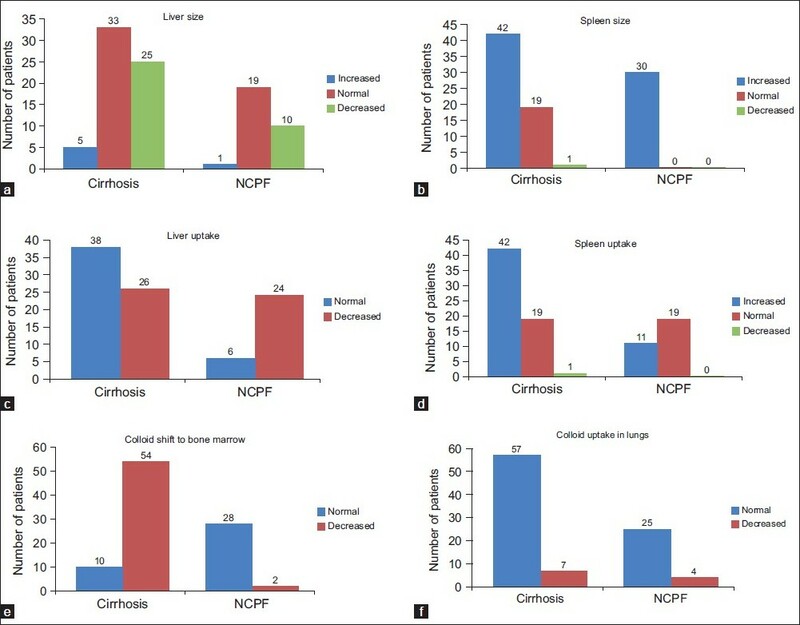 Non-cirrhotic portal ﬁbrosis (idiopathic portal hypertension): Experience with 151 patients and a review of the literature. J Gastroenterol Hepatol 2002;17:6-16. 8. Hoefs JC,Wang F, Kanel G. Functional measurement of nonﬁbrotic hepatic mass in cirrhotic patients. Am J Gastroenterol 1997;92:2054-8. 9. Hoefs JC, Chang K, Wang F, Kanel G, Morgan T, Braunstein P. Perfused Kupffer cell mass: Correlation with histology and severity of chronic liver disease. Dig Dis Sci 1995;40:552-60. 10. Hoefs JC, Wang F, Kanel G, Braunstein P. The liver-spleen scan as a quantitative liver function test: Correlation with liver severity at peritoneoscopy. Hepatology 1995;22:1113-21. 11. Sheth SG, Amarapurkar DN, Chopra KB, Mehta PJ. Significance of radioisotope bone marrow uptake on 99m technetium sulphocolloid scan in portal hypertension. J Assoc Physicians India 1996;44:310-2.